Lucena Olarte has an unusual side job. She goes into local stores in her hometown of Davao, Philippines, takes out her phone, snaps a few photos of the cigarettes for sale, and uploads them to an app. She gets paid $40 to $60 USD for around 10 hours of work a week. She's one of a growing army of data collectors working for a San Francisco company called Premise. It crowdsources photos of things like product prices, power lines and ATMs to help governments and NGOs get a clearer picture of local issues and economies. In order to help pay for its underfunded Universal Health Care program, the Philippines added a sin tax to sales of alcohol and cigarettes in 2012. The problem was that the government knew many stores weren't charging the tax but didn't know which ones. The World Bank funded Premise's initiative to recruit locals like Olarte. 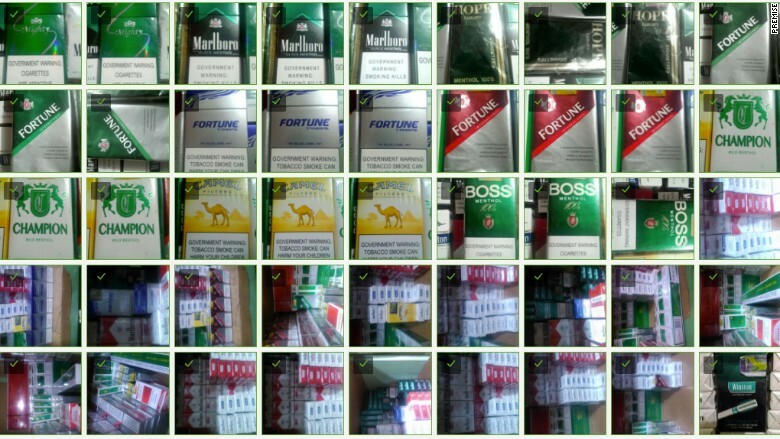 In their spare time, contributors use their own phones to snap and upload photos of cigarettes and alcohol in nearby stores, creating a visual map of which businesses have the tariff sticker. The result is a constantly updated report that shows the Ministry of Finance what areas are compliant, including by city, week, and cigarette brand. When a contributor opens the app, they see a list of locations and tasks. For example, In Kenya, they could be asked to take a photo of a residential structure to see if a power line is present, helping build a map of electrification at the street level. In Nigeria, Premise had contributors take photos of ATMs as part of a collaboration with the Bill & Melinda Gates Foundation to map out the financial access landscape. Real time photos of everything from food to buildings can help answer questions about food shortages, failing infrastructure and government programs. Similar economic data is often released by governments themselves, though infrequently and with less transparency. Related: Will Switzerland give every adult $2,500 a month? Premise's real-time approach to economic data was only made possible by the recent spread of Android and low-end smartphones. The Premise app works on smartphones up to five years old. The company does a lot of recruiting over Facebook (FB) and local job boards, and currently has more than 25,000 contributors around the world. On average, they can earn $100 to $200 USD a month, working anywhere from 10 to 30 hours. David Soloff, a former investment analyst, founded the company in 2012 and calls it "a real-time dashboard for the human condition." One of its most promising relationships is with the World Bank, which it's partnering with in 15 countries Premise's data is not yet being used by the World Bank in an official capacity, but it's working on how to use it to compliment or offer an alternative reading of official statistics. "The technology can impact a host of other development questions," said Soloff. "Not just economic measurement, but core questions about the development of a society's infrastructure, where there may be a pandemic, vaccinations, electricity in schools [or] if roads are being used and having the impact people thought they would."